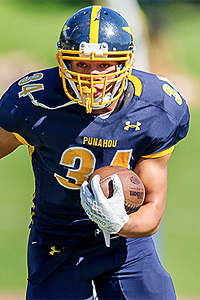 After leading Division I schools is rushing the previous two seasons, Mililani senior running back Vavae Malepeai still managed to out-do himself. 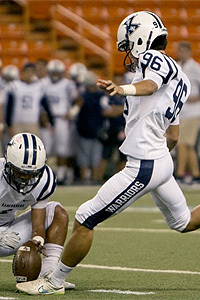 It is a main reason he is ScoringLive's All-Hawaii Division I football team's Offensive Player of the Year. 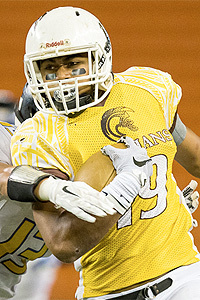 Malepeai rushed for 1,350 and 20 touchdowns as a sophomore when the Trojans finished second in the state. He rushed for 1,337 yards and 24 TDs in helping the Trojans win their first state title in 2014. This past season, he rushed for state-leading 1,944 yards and 29 TDs. When last year's Offensive POY, quarterback McKenzie Milton went down with a mid-season shoulder injury, Malepeai kept on going, even when teams knew he was getting the ball. "He was able to step up when McKenzie was out," Farrington coach Randall Okimoto said of Malepeai. "That really showed he was able to take the team on his shoulders. To me, he actually stepped up his running." Malepeai's improved performance hadn't gone unnoticed. "Every year he got better," Campbell coach Amosa Amosa said. "He did a good job or preparing himself every year." 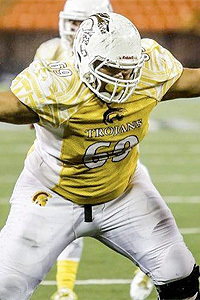 The 6-foot, 200-pound Malepeai beat opponents with his speed. When defenders caught him, he would drag them a couple more yards or simply break out of their grasps. 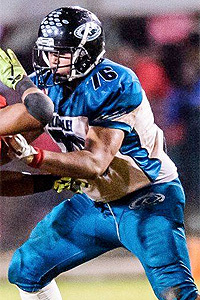 He had "the best combination of power and speed," Kapolei coach Darren Hernandez. "Not since Kahuku's Malosi Te'o's insane run in 2005 have I seen a back put up such big yards in big games," Hernandez added. 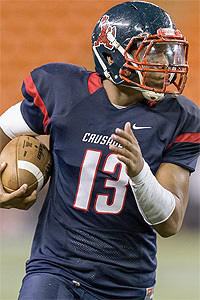 Also receiving consideration for Offensive POY was Saint Louis junior quarterback Tua Tagovailoa. 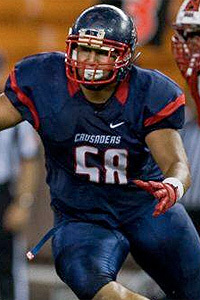 He was instrumental in helping the Crusaders claim their first Interscholastic League of Honolulu Division I crown since 2010, when they were led by a future Heisman Trophy winner and NFL QB in Marcus Mariota. Comparisons are already being made between the two dynamic players. 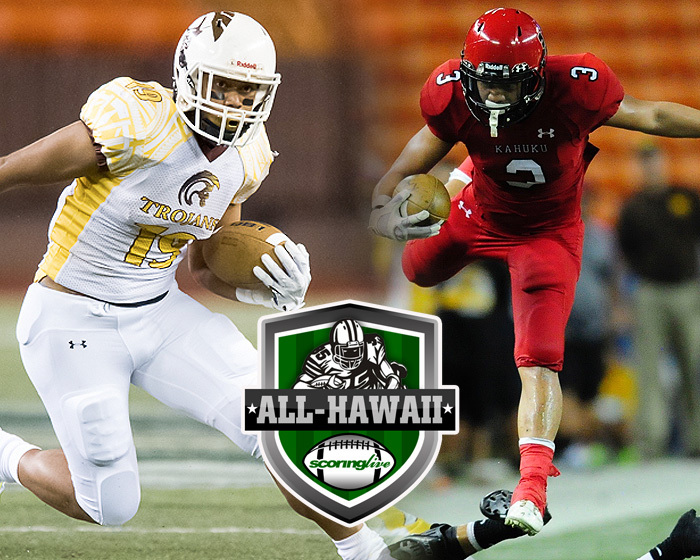 Download a printable version of the 2015 All-Hawaii Division I Football team. 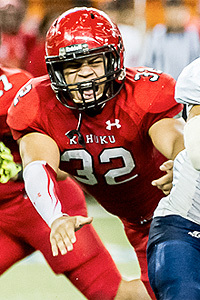 "He made big plays when it counted," Okimoto said. 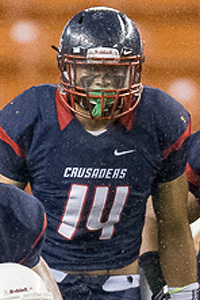 Tagovailoa nearly single-handedly led the Crusaders' offense. Running back after running back went down with injuries throughout the season. Still, Tagovailoa carried his team. 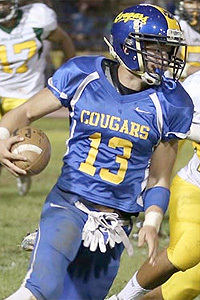 He led Division I QBs with 2,916 yards passing and had 24 TDs. He also led his team 446 yards rushing and 11 more TDs. When Tagovailoa ran the ball, he rarely went into the slide to avoid contact from a tackler. He would run right through tacklers, much like Malepeai. "We really don't want him running the ball, but to his credit, he has that ability," Lee said. "I think he's learned, like anything else, he has to be careful. He's not a fullback; you don't try to run over people, but that comes from being mature and I think he learned a lot this year. You look at his calves, you'd think he's a fullback." 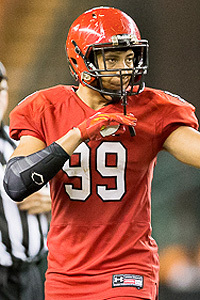 On its star-studded defense, Kahuku safety Louis Keala Santiago shined the brightest and he is ScoringLive's All-Hawaii team Defensive Player of the Year. Granted, Santiago was surrounded by an all-star cast on defense starting with a front seven that applied pressure on opposing quarterbacks. While fellow defensive backs had their share of interceptions, it seemed Santiago came up with those that broke opponents' backs. But Santiago wasn't just a ball hawk. He was a reliable tackler. 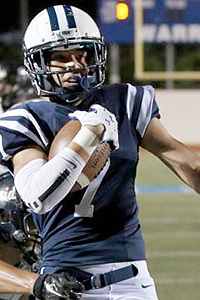 "He has a nose for the ball," Waianae coach Walter Young said. "He was always in the right place. Defensively, he made tackles in open spaces." What also made Santiago stand out was his versatility. 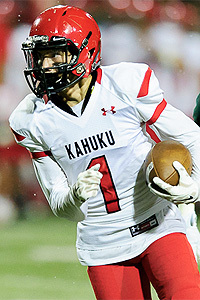 He occasionally played wide receiver in the rare times Kahuku passed. But he was dangerous as a return specialist. He returned three punts for TDs this past season. 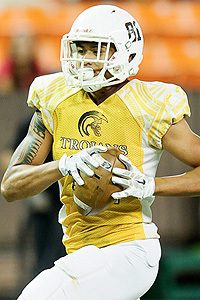 "He makes many plays, not just the safety position, but as punt returner," Mililani coach Rod York said. 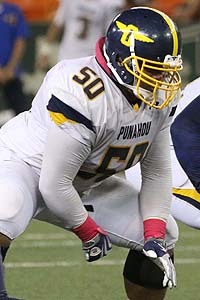 Added Campbell coach Amosa Amosa: "He impacts all three phases of the game." 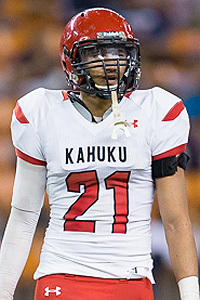 The only other players considered for the top defensive player were from Kahuku. Among them was linebacker Hirkley Latu and lineman Bradlee Anae. "That Anae, trying to block him is ridiculous," York said. 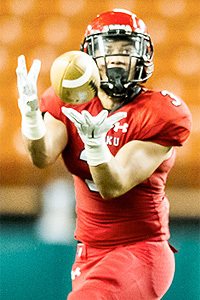 Kahuku's defense allowed fewer than a touchdown per game (4.1 points). 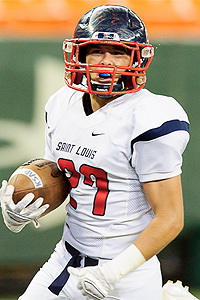 The team posted six shutouts and allowed more than one TD in its last game of the season – the Division I state title game - against Saint Louis. And even then, one of the TDs came off a blocked punt. First-year coaches excelled this past football season. 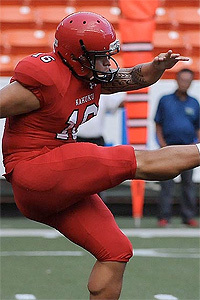 One, Kahuku's Vavae Tata went undefeated and won the Division I state title. 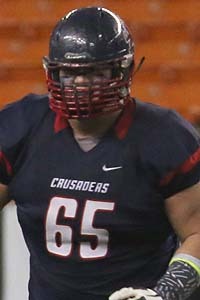 Another, Waianae's Walter Young, brought the school's first top four finish since 2010. 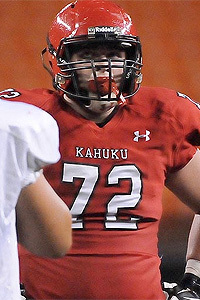 Kahuku might have had the best collection of talent, but Waianae made one of the biggest turnarounds. 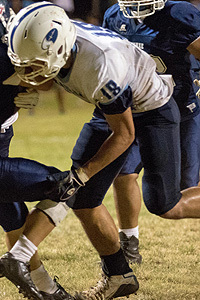 After going 5-4 and getting eliminated from postseason in the Oahu Interscholastic Association quarterfinals, the Seariders finished third in their league and was eliminated in the Division I state semifinals to end with a 9-4 record. Waianae's only losses were to top five teams in the ScoringLive/Hawaiian Electric Division I Power Rankings, three to the top three teams, two against state champion Kahuku. Young, a 1998 Waianae graduate, is ScoringLive's All-Hawaii Division I team's Coach of the Year. Young "changed the culture by having his kids give back to the community," Leilehua coach Nolan Tokuda said. In keeping with Waianae's tradition of focusing on team instead of the individual, Young restored the pride of the west side. You could not tell who were first-team players, especially at running back. 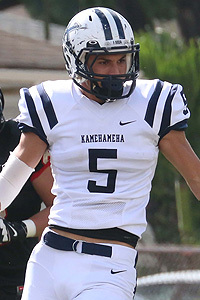 It was not unusual to see 10 different rushers in a typical Waianae game. Everyone literally carried the load. Off the field, the Seariders were just as impressive. Players did community service projects and were expected to dress with pride off the field. 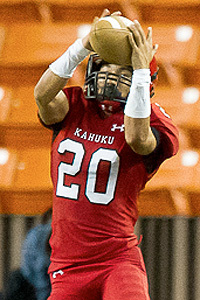 Waianae also held Kahuku to its fewest points this season in a 13-0 loss in the Division I state semifinals. It was a huge turnaround from its 30-0 regular-season loss to the Red Raiders. 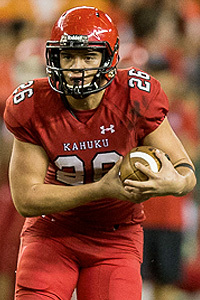 Also receiving consideration for the coach's honor was Tata, a Saint Louis graduate who beat Kahuku in the Prep Bowl. He inherited a team that was loaded, but had to overcome early adversity when he lost his quarterbacks to injuries and was forced to make the best with the talent he had – talent that other schools wished they had. 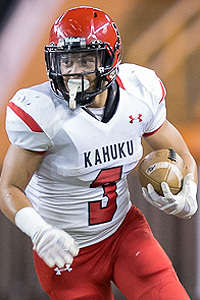 "All Tata did was go undefeated in his first season and restore the Kahuku dynasty," Kapolei coach Darren Hernandez said. "And he beat Hawaii's most iconic and winningest coach (Saint Louis' Cal Lee) and shut down a marvelous QB in Tua Tagovailoa."